Cate's blog about the kayak adventures of Liquid Fusion Kayaking in Fort Bragg, on the Mendocino Coast, and beyond. The Mendocino Coast is seeing a rock'n and rolling winter. The rains are beautiful and replenishing our water supply. 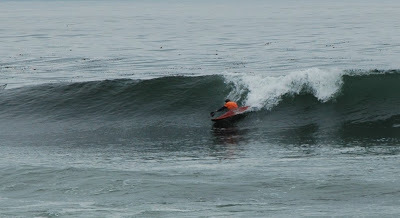 The ocean has been rocking with giganitic swells that send waves crashing through our usually calm and protected bays. It is spectacular to watch the power of the ocean as 30+ foot waves roll over everything in their path. Winter is a good time for us to go with the flow (literally). 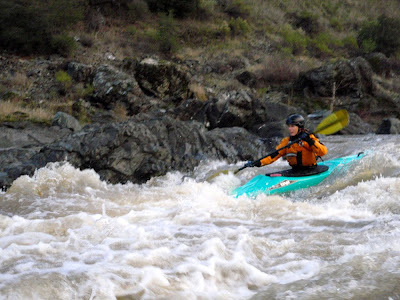 Winter rains make our North Coast rivers fun for white water kayaking. We have been paddling two of our Mendocino County favorites, the Eel River and Rancheria Creek, and are looking forward to more as our winter rains continue. While the ocean has been rocking, we have been rolling and playing games in Fort Bragg's new aquatic facility. Beginner and experienced paddlers have been enjoying the comfort of 79 degree water to learn and practice eskimo rolling and other kayak skills. 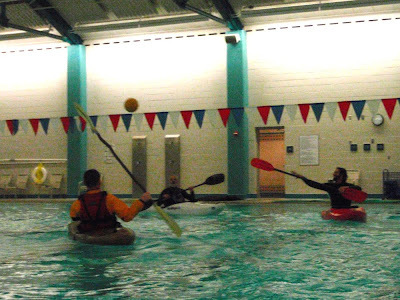 We have started tossing the polo ball about and are preparing for our Kayak Polo and Games Class in February. Surf has been up - WAY UP on some days. In between days of whitewater kayaking, we have been scouting the surf and finding some fun waves. We are contemplating a trip to Santa Cruz at the end of March to complete in the 24th Annual Santa Cruz Kayak Surf Festival. With all of this winter kayaking, we haven't been in the office much. We are excited about 2010. New for 2010 is our Tracks to Kayaks Adventure with the Skunk Train and our Discover Kayaking class. We are also increasing our sea kayak tours and classes to include monthly sea kayak tours of the Mendocino Coast on the second Sunday of the month and sea kayak rock gardening classes. Check out our calendar to see what we have going on.